Woolworths is continuing to turn itself around, with supermarket food sales helping out. For the first half of its 2017 financial year, sales growth in the group’s Australian food division increased by 2.8 per cent. The group achieved a net profit after tax (NPAT) of AUD $725.3 million after selling Masters and its petrol business, but had a 16.7 per cent fall in NPAT from continuing operations. In announcing the Woolworths’ Groups’ half yearly results, Chief Executive Officer, Brad Banducci, said the group had made good progress on its five key group priorities. “Particularly pleasing was the improvement in sales momentum in Australian Food, especially in the second quarter,” Banducci said. “This is on the back of strong Voice of Customer scores and is underpinned by continued growth in customer transactions and, more recently, items per basket,” he said. Alongside Australian food sales increasing an overall 2.8 per cent for the first half of the year, Woolworths said comparable sales in December (2016) were the strongest for the year driven by strong comparable transaction growth an improvement in items per basket. “Earnings before interest and tax declined 13.9 per cent on last year primarily impacted the reinstatement of team incentive payment, team training and higher depreciation from our renewal and IT investments,” Banducci said. 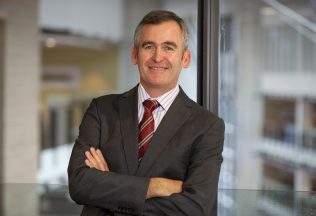 The first half of the financial year saw Woolworths sell its petrol business and establish a new rewards partnership with BP, that Woolworths is confident in. “Once completed, customers will have more fuel redemption options and increased ability to earn Woolworths Rewards points and we will have an opportunity to partner with BP in rolling out our new Metro@BP concept,” Banducci said. “The proceeds from the sale of our Fuel business will be used primarily to strengthen our balance sheet,” he said. Woolworths’ Endeavour Drinks Group, which includes its highly successful Dan Murphy liquor stores, delivered a sales growth of 4 per cent. “All retail formats delivered positive comparable sales growth with strong double digit growth from Dan Murphy’s Online,” Banducci said. New Zealand food sales increased by 1.6 per cent on the prior corresponding period. Earnings were however below last year’s profits, with Woolworths attributing this drop to investment in team hours, costs of its new loyalty alliance with AA Smartfuel and uninsured losses related to the November 2016 earthquake. The winners of the 2016 Healthy Food Guide Awards have been announced. BWS is now selling a variety of wines packaged in cans across its Australian store network.